Interesting. Always good to be mindful of your stance when your jointing on the edge. I tend to Barack back and forth at times and of course my work always Palin comparison to yours so I'm just Biden my time until my skills develop. Ummmm, McCain. (yeah I ran out of creative steam at the end there). Enjoy your topical post! Don't feel too bad Kari. Even though I'm firmly centered. It seems I don't have any blades available and even though there are some promising blades that out there they either careen too far to the left or right to be able to produce a truly square edge. I wish I could just trash all the blades I have and replace them all with new blades that haven't been sharpened and honed out of square. What's so great about being square anyway! This is a common problem no matter where your political stance may be, and it is the stance and the natural tendency to go tilt to the left (if you are right handed, the opposite is true for those folks). Because we are standing to the side, it is natural to apply more pressure on that side. If you stand directly above your work and start on the off side you can reduce this problem. I avoid the entire issue by using a shooting board whenever possible. Regardess of your personal leaning, hand tool work is very LIBERTARIANating if you have the physical CONSTITUTIONALIST for it. At the least, (go ahead and groan), you will make your friends GREEN with envy. I've also read in David Finck's book that the iron should be sharpening dead straight across with no hint of an arch, what do you think about that? Nick, all of my planes are sharpened straight across, with no arc, except for my scrub plane. You can hone the corners of the iron down a bit to remove the inevitable track marks, but otherwise, I agree with David. Right, i found i wasnt able to hone in an arch anyways haha. what should i do with my blades now? try and straightne them out on the stone or just kiss them with the grinder and re-hone? Re plane blade profiles, I have 4 blades for my main plane, 2 are dead straight - used for edge jointing or any planing where the board is narrower than the blade - and 2 are slightly curved for planing larger surfaces. The multiples mean I can plane for longer before returning to the sharpening stones. 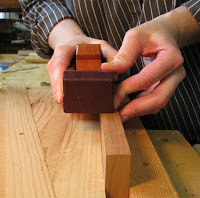 I find it impossible to plane a wide surface with a perfectly flat blade without leaving some steps. The curve is very subtle though - a lot less than a scrubbing plane. 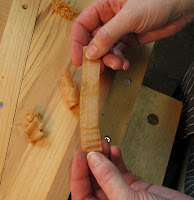 Keith Cruickshank shows one method for honing a gentle curve in one of his videos. I suspect my method may create a more even curve across the whole blade. When planing some difficult woods it can be an advantage to have a reduced cutting width in your blade while still using a wide plane. Kari - what's absolutly critical, which you may not have taken into consideration, is the bench top. It must be dead level in both directions (check with a spirit level) to give youself fighting chance of planing square and also of course, should be the right height. The easiest way to adjust it is to shim under the legs with some oddments of hardboard or thin ply whilst the bench is supported, not by your good self (while you try and scuffle the bits of wood under the legs with your foot) but by a car jack under the front rail...makes the whole shooting match a lot easier. I hone all my blades with a slight camber, easily done with a honing guide and finger pressure. Blade backs are polished using the 'Ruler Trick' so that just the first 2mm or so of the back is highly polished. Blade sharpening and whether or not to put an arc on the blade....that is a much-discussed topic. As is the ruler trick. I can't comment on either, because I've never tried them. I know Chris Schwarz wrote at least one post on blade arc and that David Charlesworth wrote about the ruler trick, but if anyone would like to offer their preference and why it's their preference, feel free. Nick, I would take the iron back to the grinder to reshape the edge. Rob, I think the height of my bench might have something to do with it. 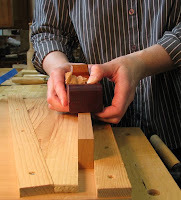 I started to build a lower bench/assembly table several years ago for use in hand-planing, but never finished the working surface. This might give me the incentive to complete it. Enjoy your holiday! 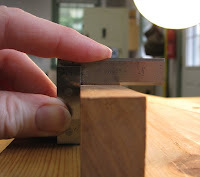 Kari wrote - "I think the height of my bench might have something to do with it"
There is another approach to making an edge square which EXPLOITS a cambered blade, and turns a non square edge into a square edge by taking shavings with a controlled side-to-side taper, as opposed to making a step-wise approximation via partial width shavings with a straight blade. Summer's pretty much over but it's not too late for out door projects. Why not make an outdoor napping spot with earth-friendly bambo. There's a particular variety that's well suited to build the frame, it's called "HamMcCain". Ok, that was weak but I had to dry something to help out a fellow "chuck" after he was left hanging on McCain.